SOUTH SUDAN referendum ended on Monday 07 February 2011 with the official announcement of the results which indicated that 98.83 percent of the voters have voted for separation. The celebration for the announcement of the final result of the referendum was attended by a number of regional and international personalities including head of the Africa Union (AU) Panel on Sudan Thabo Mbeki, UN Representative in Sudan Haile Menkerios, Arab League (AL) representative, and European Union (EU) representative together with representatives of the diplomatic missions in Sudan and others. "We have received the result and we heartily accept it because it expresses the will of the south Sudan citizens," said Sudanese President Omar Al-Bashir. Mr Bashir further issued a Republican Decree accepting the final results of south Sudan referendum. President of South Sudan government Salva Kiir Mayardit stressed the importance of building strong relations between north and south Sudan, adding that the border between the north will be only borders on paper, and it will be a soft border. He urged the international community to reward Al-Bashir and the ruling National Congress Party (NCP) for their remarkable role in implementing the Comprehensive Peace Agreement (CPA), which was inked between north and south Sudan in 2005. After 9 July there will be two new countries in present day Sudan. Each will need a new constitution and new politics. Note that the UN hails South’s vote for independence, but cautions on tasks ahead. Also, the Secretary-General’s Panel which he appointed to monitor the referendum, noted in a statement that the tone of media coverage and public statements from senior government officials improved as the voting neared. “In spite of political uncertainty and some security incidents during the referendum period, and sometimes inadequate efforts to inform voters about their rights and options, the Panel concludes that voters were able to express their will freely,” it said. Further details and news roundup here below. Al-Bashir further issued a Republican Decree accepting the final results of South Sudan referendum. "The Presidency hereby declares its respect for the option of the people of the south, and our acceptance of the outcome of the referendum. The Presidency renews its resolve to move forward in order to sustain peace, development and stability, work to resolve the remaining outstanding issues and build positive and constructive relationships between the two parts of the country," the decree read. In the meantime, the Sudanese Council of Ministers on Monday approved South Sudan referendum result in an extraordinary session chaired by Al-Bashir in presence of his two Vice-Presidents Salva Kiir Mayardit and Ali Osman Mohamed Taha. Sudanese Minister of Information Kamal Obaid told reporters following the council's session that the council approved the result and congratulated the people of South Sudan for their option. It affirmed the meanings for which the president has called in a number of occasions on continuation in supporting the south until it completes the conditions required for the establishment of the state on July 9, 2011. "I am proud that we have been able to defy the doubters, with a calm vote – a clear show of everyone's heartfelt wish for peace" -Sudanese citizen and presenter at Radio Bakhita, Morri Francis. "The young will go to the bars, but there are many like me who will remember the cost of this achievement, the deaths of so many of our people” -Sudanese citizen and widow Mary Akoch. Sources: See reports below, followed by further reading including news report from UN News Centre entitled "UN hails South’s vote for independence, but cautions on tasks ahead". The speakers were crackly and the outdoor cinema screen flickered. Those at the back in the dark of the giant thousand-strong crowd could hardly make out what was being said. But for the southerners gathered to watch the results of their historic independence referendum, only one message mattered: the confirmation that the south will become a nation of its own. As the result was confirmed, that 98.83% of the voters had backed independence, those at the front leapt up, waving flags and cheering. Those at the back, hearing the shouts of delight, began to dance. "We are free, we have won our independence!" shouted former soldier William Machar. "This is our moment in history, when we watch our baby-nation being born." People in the southern capital of Juba flocked to the grave of former rebel leader John Garang, the first president of the south, to hear the results broadcast live from Khartoum. Hundreds sat on plastic chairs, craning their heads forward to hear the historic words. One woman, like hundreds of others, waved a southern flag. "This is the symbol of the 193rd country in the world," she shouted, followed by an ear-splitting ululation. 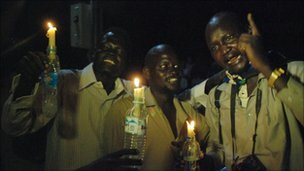 One group of young men came with candles rammed into plastic drink bottles, pre-emptively welcoming in the birth of the new nation. "Happy birthday our country, happy birthday Southern Sudan," they sang, arms draped around each other in celebration. The south is not due to declare formal independence until 9 July. "I was born in war, and I grew up as a soldier," said Robert Duk, a student. "So for me to see this day, something I dreamed of but never could believe, is something I find hard to put into words." Despite the excitement following the result, people quickly sat down to listen to the next speech, intent on hearing all that was said. "This is what happens when you oppress and marginalise a people for over 50 years," said Puok Dieu, who fought in the civil war. "One day those people will rise up and say: 'It is enough.'" "The results of the referendum mean I am free today," said Abiong Nyok, a housewife. "Now I am a first-class citizen in my own country." The crowd was in a mood to party. "We are going to take to the streets and celebrate until dawn," said Peter Deng, a youth leader. "All us here grew up during the war, so we are so happy to be celebrating our freedom in peace." But away from the live screening in the centre, Juba seemed quiet. Many in the south have already privately been celebrating the results, which have filtered out in recent days. "We in the south never had any doubt what the results would be," said Alfred Juma, a teacher. "But it is a great relief to hear it confirmed, and to hear that the north have accepted it too." Others however were more reflective. "We will celebrate at home," said Mary Akoch, a widow whose husband died in the two-decades of conflict. "The young will go to the bars, but there are many like me who will remember the cost of this achievement, the deaths of so many of our people, so many of those who we loved." (KHARTOUM) - South Sudan referendum ended on Monday with the official announcement of the results which indicated that 98.83 percent of the voters have voted for separation. South Sudan Referendum Commission (SSRC) Chairman Mohamed Ibrahim Khalil said 3,792,518 voters voted in favor of separation while 44,888 voted for unity. He explained that the total number of eligible voters amounted to 3,851,994 and that the number of valid votes amounted to 3,837, 406. Khalil said 3,724,194 voted in south Sudan and 3,697,467 of them voted for separation, while 16,129 opted for unity. The number of voters in north Sudan amounted to 69,597, of whom 38,003 voted for separation. In the eight overseas countries, 58, 230 cast ballots and 57,048 of them voted for separation. Sudanese President Omar al-Bashir earlier in the day declared acceptance of the referendum results which were submitted by the SSRC to the Sudanese presidency. "We have received the result and we heartily accept it because it expresses the will of the south Sudan citizens," said al-Bashir. Al-Bashir further issued a Republican Decree accepting the final results of south Sudan referendum. "The Presidency hereby declares its respect for the option of the people of the south, and our acceptance of the outcome of the referendum. The Presidency renews its resolve to move forward in order to sustain peace, development and stability, work to resolve the remaining outstanding issues and build positive and constructive relationships between the two parts of the country," the decree read. President of South Sudan government Salva Kiir Mayardit, addressing the council's session, said "separation is not the end of the road and we will not be enemies." He further stressed the importance of building strong relations between the two sides, adding that the borders between north and south Sudan would be only on papers. He urged the international community to reward the al-Bashir and the ruling National Congress Party (NCP) for their remarkable role in implementing the Comprehensive Peace Agreement (CPA), which was inked between north and south Sudan in 2005. "The person who does good things must be rewarded, " he said. " Sanctions imposed on Sudan must be lifted, Sudan's name must be removed from the list of countries sponsoring terrorism and its external debts should be exempted." Meanwhile, the UN Secretary-General's Panel on the Referenda in Sudan on Monday welcomed the official announcement of the final results of the south Sudan referendum. "The Panel believes that the referendum's outcome reflects the free will of the people of south Sudan and that the process as a whole was free, fair and credible," the panel said in a statement. South Sudan referendum was conducted between Jan. 9 and Jan. 15, 2010, which constituted a major item in the CPA, which ended around two-decade civil war between the two sides. 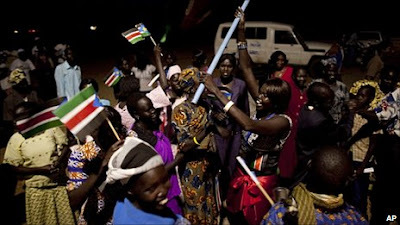 8 February 2011 – (Khartoum) – Southern Sudanese celebrated on Monday night as they welcomed the final announcement of the independence referendum results. The Dr. John Garang Mausoleum in Juba was jam-packed with excited citizens who watched the announcement on large television screens being relayed live from Khartoum. After hours of waiting, the crowds broke into song, dance and ululation when the final results indicated that more than 98 percent of southern Sudanese voted for independence. The announcement was made by the Chairman of the SSRC, Professor Mohamed Ibrahim Khalil at the Friendship Palace in Khartoum on Monday evening. The official announcement of the referendum results was attended by diplomats and senior government officials. Earlier in the day, the chairman of the southern Sudan Referendum Commission officially handed over the results to President Omar Al Bashir and his two vice Presidents, Salva Kiir, and Ali Osman Taha respectively. Addressing an extra-ordinary Council of Ministers meeting in Khartoum, President al-Bashir affirmed his acceptance of the final results of the southern Sudan referendum. Addressing the same Council of ministers meeting, first Vice President of the republic and GOSS President Salva Kiir Mayardit said the referendum results outline the popular will of the people of southern Sudan. But he added that south and north Sudan will continue to depend on each other. 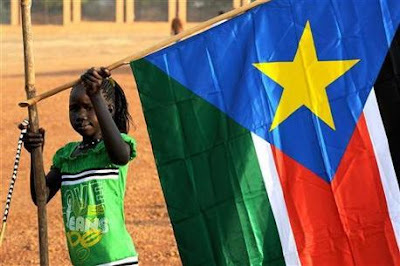 Southern Sudan will fully become an independent state on July 9th. The U.S government already says that it will recognize the independence of southern Sudan. 8 February 2011 – (Khartoum) – The chairperson of the African Union High Implementation Panel says that the successful conduct of the southern Sudan self-determination referendum is a clear indication that northern and southern Sudan will continue to co-exist peacefully. The AUHIP congratulated the Sudanese leaders for their commitment in safeguarding the CPA up to the referendum which was one of the crucial provisions of the CPA. Addressing Sudanese leaders and diplomats shortly after the announcement of the final referendum results in Khartoum on Monday, the AUHIP chairperson, Thabo Mbeki said the success of the referendum in Sudan will help promote democracy in Africa. Thabo Mbeki added that although the referendum attested Africa’s ability to resolve conflicts in the continent and achieve its common goal, the people Sudan should continue nurturing peace in both independent states. Thabo Mbeki urged the SPLM and the NCP to swiftly settle the remaining items in the post-referendum arrangements. REMARKS BY THABO MBEKI, AUHIP CHAIRPERSON, AT THE CEREMONY TO ANNOUNCE THE FINAL RESULTS OF THE SOUTH SUDAN REFERENDUM: KHARTOUM, FEBRUARY 7, 2011. Click here to read full text at Alex de Waal's blog Making Sense of Sudan - ssrc.org - Posted on Tuesday, 08 February 2011 at 2:18 am. European Union foreign policy chief Catherine Ashton on Monday hailed the "historic moment for Sudan" upon the announcement of the final results of an independence referendum in Southern Sudan. She praised the January referendum as "timely and credible," saying it "resoundingly expressed" the determination of the people of Southern Sudan to establish an independent state. An overwhelming majority of registered voters participated in the vote overseen by the Electoral Observation Mission. "The EU fully respects the outcome of the referendum as a true reflection of the democratically expressed wishes of the people of Southern Sudan," Ashton said. The EU looks forward to developing a "close and long-term partnership" with Southern Sudan, which is set to become a new state by July according to a peace agreement, Ashton added. ‘”I welcome today’s announcement of the results of the referendum on Southern Sudan. “This moment is testament to the leaders in both North and South Sudan who ensured a credible and peaceful process. I particularly welcome the positive reaction of the government in Khartoum and their clear statements that they will respect the wishes of the South to secede from the North and establish an independent nation. “North and South now need to work together to implement the remaining provisions of the 2005 Comprehensive Peace Agreement ahead of its conclusion on 9 July 2011. The United Kingdom will continue to support that process strongly as a new chapter in its relations with the peoples of both North and Southern Sudan emerges”. (OTTAWA) — Canada will recognize southern Sudan as an independent state later this year, Prime Minister Stephen Harper said Tuesday as he praised its landmark independence referendum. The referendum was "a historic moment for the country" and a "critical step" toward peace, said Harper, adding: "Canada is prepared to recognize southern Sudan when it becomes an independent state in July of this year." Final results announced Monday showed that 98.83 percent of southern Sudanese had voted to secede from the north, paving the way for the declaration of a new state in July. Harper said Canada, which so far contributed 800 million dollars for humanitarian assistance, development and peace-building in Sudan, stands ready to assist the parties "in charting their post-referendum future." (WASHINGTON, Tuesday) - The United States said yesterday it will recognise south Sudan as the world’s newest nation as it moved to reward the north for its cooperation by taking it off a terrorism blacklist. Just hours after results from a referendum showed that 98.83 per cent of southern Sudan favoured secession, President Barack Obama announced that the United States would recognise it as a “sovereign, independent state” in July. “On behalf of the people of the United States, I congratulate the people of southern Sudan for a successful and inspiring referendum in which an overwhelmingly majority of voters chose independence,” Mr Obama said. “After decades of conflict, the images of millions of southern Sudanese voters deciding their own future was an inspiration to the world and another step forward in Africa’s long journey toward justice and democracy,” Mr Obama said in a statement. In Cape Town, Nobel peace prize winner Desmond Tutu and other members of a group of global statesmen known as The Elders today praised the landmark vote. French President Nicola Sarkozy welcomed announcement of final outcomes of Sudan's referendum, calling on concerned parties to continue dialogue post referendum. French Presidency issued statement congratulating south Sudan citizens on participating in the historic referendum, in addition to congratulating parties to CPA for conducting vote as scheduled. Sarkozy affirmed that France is committed to support all Sudanese parties to pass transitional period peacefully. Ambassador Mohammad Monsif from the Arab League (AL) welcomed final outputs announced yesterday. He affirmed that AL is keen on preserving peace and stability in Sudan, adding AL is to participate in resolving post referendum issues. He added that the referendum has been impartial, credible and free according to international standards as AL has participated in observing the vote. Secretary General of Islamic Conference Organization Prof. Ekmeleddin Ihsanoglu welcomed announcement of final results of referendum, lauding conduction of vote for self-determination under sound environment. He also praised President's acceptance of outcomes, calling different Sudanese parties to reach for final compromise for outstanding issues. He renewed ICO commitment to support Sudanese parties, calling on the international community to fulfill its obligations. Saudi Cabinet expressed its hope that results of referendum which favored secession overwhelmingly will contribute to preserve sustainable peace allover Sudan. Minister of information Abdel Aziz Khouja said that Saudi Arabia hopes that the relation between south and north will be established on cooperation and good neighborhood. German Minister of Foreign Affairs Westerwelle welcomed announcement of final results, saying in a statement issued yesterday that the outcomes reflect southerners' desire to form their own future. He called on respecting the outcomes in addition to applying them peacefully. He affirmed importance of facilitating process of secession which required resolving of borders demarcation, citizenship, division of natural sources and oil. He added that the German government told the UN and the EU that it is ready to support Sudan in order to preserve security and stability. Switzerland has praised the “relatively calm, peaceful and ordered” proceedings of Southern Sudan's referendum on independence. Switzerland has been supporting both north and south Sudan as a neutral partner in their moves towards creating lasting peace in Sudan, the ministry added. For the past several months it has been providing technical expertise about the division of riches and debts in the banking sector. Three Swiss were also sent to form part of a European Union observer mission during the referendum. Click here for full story. 7 February 2011 – The United Nations today hailed the announcement of the official results of South Sudan’s referendum – which showed that an overwhelming majority opted for secession – and called on both sides to agree quickly on a host of issues stemming from the separation and to resolve the future of a disputed area. Both Secretary-General Ban Ki-moon and the panel he appointed to monitor the referendum urged the sides to reach lasting post-referendum arrangements, building on the momentum generated by the successful holding of a vote that by 9 July will sever a third from what has until now been Africa’s largest country and is widely expected to lead to the creation of the UN’s 193rd member state. Such issues include border security, citizenship, wealth-sharing, frontier demarcation, and popular consultations in the states of South Kordofan and Blue Nile – and Abyei, an area straddling northern and southern Sudan, that was due to have voted in a separate but simultaneous referendum on which side it would join. But a referendum commission has yet to be established there, and there is still no agreement on who would be eligible to vote. Mr. Ban appointed the panel, headed by a former Tanzanian president, Benjamin Mkapa, to monitor January’s week-long vote, a culminating point of the 2005 Comprehensive Peace Agreement ending two decades of civil war between the north and the south that killed some two million people and drove an estimated 4.5 million others from their homes. In a statement [ http://www.un.org/apps/sg/sgstats.asp?nid=5081 ] issued today by his spokesperson, hailing the announcement of the results, Mr. Ban said the “peaceful and credible conduct of the referendum is a great achievement for all Sudanese.” The statement went on to call on the international community to assist all Sudanese towards greater stability and development, reiterating the UN commitment to do so. In its statement, the Secretary-General’s Panel noted recent deadly clashes in Abyei – ”which have only further complicated the situation” – and stressed the continuing importance of the protection of all Sudanese civilians, whether northerners or southerners. “The Panel believes that the referendum’s outcome reflects the free will of the people of Southern Sudan and that the process as a whole was free, fair and credible,” it said, citing an appropriate environment and security conditions for the free exercise of the right to self-determination, the high degree of transparency, and the extensive participation of civil society organizations. It noted that the tone of media coverage and public statements from senior government officials improved as the voting neared. “In spite of political uncertainty and some security incidents during the referendum period, and sometimes inadequate efforts to inform voters about their rights and options, the Panel concludes that voters were able to express their will freely,” it said. The Panel also commended the Southern Sudan Referendum Commission for overcoming numerous challenges to administer the vote successfully, the UN Mission in Sudan (UNMIS), the UN Integrated Referendum and Electoral Division, and international electoral advisers, donors and observer groups for their assistance. “The Panel congratulates the people of Sudan for their discipline and patience, which ensured the process was peaceful and on schedule,” it said in its statement. Throughout the referendum period, UNMIS intensified its peacekeeping patrols in Abyei after reports of clashes between Arab nomadic cattle-herders, known as Misseriya and linked to the North, and the Dinka ethnic group linked to the South. 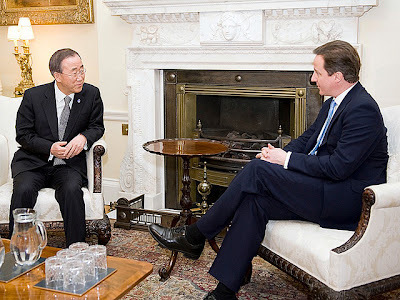 The other two members of the Secretary-General’s Panel on the Referenda in Sudan were António Monteiro, a former Portuguese Foreign Minister, and Bhojraj Pokharel, a former Chairman of the Election Commission of Nepal. The UN Development Programme (UNDP), which provided ballots and registration kits, voter registration campaigns, logistics, and technical support for the referendum, also hailed the results. United Nations peacekeepers have positioned armoured personnel carriers and are patrolling an area in Sudan where units made up of Northern and Southern Sudanese troops clashed last week, killing 54 soldiers and wounding 85 others. All movement restrictions at the Malakal airport, which was closed after the clashes, have been lifted, and it is now open for regular traffic. Click here for report from Reuters by Reuters published Monday, 07 February 2011. Many people feel South Sudan's best hopes of a peaceful birth lie in the consensus-building skills of its unassuming leader, Salva Kiir. The former army intelligence officer is already a hero to most southerners for guiding them to January's independence referendum, which saw a vote to secede from the north after years of civil war. Mr Kiir, inset right, now has to take the oil-producing, but desperately underdeveloped, territory further to full independent statehood. His first challenge will be to get through the next five months of negotiations with his old enemies in the north over volatile issues, including division of oil revenues in the build-up to 9 July. Mr Kiir's imposing appearance, towering over most other politicians and sporting his trademark cowboy hat, masks an understated political operator who favours cautious consensus-building over confrontation. When Mr Kiir first stepped up as the leader of the semi-autonomous south in 2005, many compared him unfavourably with his firebrand predecessor, the civil war hero John Garang. His quiet approach and lack of polarising rhetoric could now be his main strengths in governing a landlocked territory handicapped by tribal divisions, severe poverty, unstable neighbours and huge supplies of privately held weapons. "With Garang it was a revolution," said International Crisis Group analyst Fouad Hikmat. "But now is the time to listen to others, rather than imposing decisions." Mr Garang led the Sudan People's Liberation Movement for more than two decades, fighting for a "New Sudan", with equal rights for all of Sudan's peripheries. He died in a helicopter accident in 2005. Mr Kiir has concentrated on keeping his fragmented region united. "He did survive the whole of the war … He's got some political skills there," said Roger Middleton, from London's Chatham House think-tank. 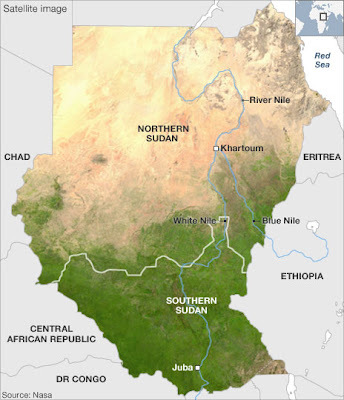 8 February 2011 – (Khartoum) – As Southern Sudan awaits the birth of a new nation on July 9th, the government of southern Sudan faces many challenges ahead. The GOSS minister for Peace and CPA implementation Pagan Amum says that although there are indeed many challenges, the government is up to the task. He spoke to SRS on Tuesday from Khartoum after the announcement of the final results on Monday. Mr Amum who is also the SPLM Secretary General, said that the two partners are now engaged in discussions aimed at resolving the post-referendum issues, which include Abyei and the north-south border demarcation. Amum further revealed that the SPLM Political Bureau will meet on the 12th to the 15th of February to review the situation and discuss the future of the party in both the north and south. He emphasized that the two parties are committed to ensure that peace prevails between the two new neighboring states once independence is declared. Nobody likes anarchy. Equally nobody likes repression. In Sudan people not only watch events in Egypt, in some cases they also try to emulate them. On 30 January there were small protests in Khartoum. In several other cities these have continued sporadically during the week. The police response has been firm with protestors detained, tear gas and batons used, and some media disrupted. But overall one has to say that Khartoum is far from Cairo and the River Nile doesn’t seem to be flowing southwards. Against this backdrop, I have had interesting conversations this week. Change – political and constitutional – is not just in the air and openly discussed, it’s written into the script. After 9 July there will be two new countries in present day Sudan. Each will need a new constitution and new politics. This is an exciting time during which all parties and political leaders are making choices that will profoundly affect the lives of millions. Talk in both Juba and Khartoum is of dialogue, reaching out to opponents, broad-based government, accountability, freedoms and rights and the devolution of powers. Where it will all end nobody knows. But it’s the right debate to be having and it is a moment of real opportunity. As one wise political figure told me, “Government is like a mirror. When you hold it up, you want to see your reflection not somebody else’s.” In a country as ethnically, religiously and economically diverse as Sudan that is true ten times over. Constructing the mirror is a task for the coming months, just as much as resolving some of the final issues flowing from the referendum. The UK role goes beyond words. We have funded in recent years plenty of activity in support of Sudanese working on the constitution, as well as providing practical training for political parties. At more of a grass-roots level, we are improving access to justice and the rule of law through a multi-million pound Safety and Access to Justice Programme. On Thursday I nearly saw for myself some of its work in Blue Nile State. But, at the last minute, Governor Malik Agar had to come to meet President Bashir in Khartoum. Political dialogue will become even more important in the weeks ahead if the Sudanese are to have the mirror they need. Photo of Morri Francis, a student and radio presenter based in Juba, southern Sudan who presents on Radio Bakhita, a Catholic radio station supported by development agency Cafod [ http://www.cafod.org.uk/ ], which raises awareness about the referendum on independence and promotes voter education and peace programmes in southern Sudan. It is the responsibility of every citizen of 'south Sudan', including me as a young person, to bring about our success. On Monday, I joined hundreds of people packed into the John Garang Memorial Centre, armed with small "South Sudan" flags. A big TV screen connected us to the Southern Sudan Referendum Commission in Khartoum. Finally – the announcement that all of southern Sudan has been waiting to hear – the results of our vote on our future, whether or not to become a separate nation. As I heard the news, my mind was ringing with the challenges ahead. Then my phone also started ringing, with friends from around southern Sudan telling me how they were celebrating. People were happy but calm, as they had already known that the results were a landslide. Some groups went to hotels and bars to party, and danced until morning. I am proud that we have been able to defy the doubters, with a calm vote – a clear show of everyone's heartfelt wish for peace. Unified in our almost 100% vote for separation, among southerners the talk on the street is now a determination to pull together for the development of our new nation. I hear more than 200,000 southerners have returned from the north, many coming back with the desire to develop our new nation. In Juba, where I live, many are stranded at the Nile River port, still awaiting assistance so they can reach their final destination. The hopes and expectations of southerners for our new nation are enormous, and there are difficulties ahead. Our jobless youth hope for a new start in life, our parents hope for schools for their children – everyone is dreaming of a better tomorrow. We are all citizens of our new nation now, and it is the responsibility of every citizen, including me as a young person, to bring about our success. We need to pick ourselves up from a sad position, as a country suffering, with terrible poverty statistics because of the war, and accelerate ahead so that we can compare ourselves more proudly against other nations. And I want to finish my education and be a part of it. If we can manage our own resources, perhaps there is hope, finally, for development in the south. But the reality is that not everyone will have a job, clean water, paved roads and good housing immediately, so I hope we can be patient while we work together to make the dream come true. They say Rome was not built in a day, and southern Sudan won't be either. I know investment will be very important to the south's growth, and to tackle poverty. The international community should understand that the south is a new nation that will need a lot of support. With six important months before the peace accord comes to an end, our politicians must get moving on solutions to the outstanding issues, such as citizenship, border demarcation and sharing oil revenues. But in the same way the vote took place on time, I'm cautiously optimistic that these too will be settled; even if, as usual, political posturing will play its part. I think we've reached the stage where there can be no backsliding. Politicians in the north and south must start to build good relations with neighbours, because we will need each other – in trade, in peaceful co-existence, and even in families whose parents have married across the divide. The southern government must ready itself to become an independent nation. But success requires teamwork, and the southern governing party, the Sudan People's Liberation Movement, must ensure democratic and inclusive government that incorporates all the ethnic diversity of the south. In the spirit of Monday's results, my hopes are still positive, because I hope our united optimism will lead us to achieve together the peace and justice we have been fighting for.